Growing up, tacos were a staple in our household, and very much a fan favourite. If my sisters or I ever caught wind that they were on that week's menu then that was it - tacos on the brain for days. We'd talk about what fillings we would used and how many we could eat, and argue about who was more excited for taco night. We were buzzing and we wouldn't calm down until we had our hands on those crunchy shells of Mexican goodness. And then, after we finished our tacos we needed to find out when the next taco night was going to be, and can it please be tomorrow? Well a couple of decades later and nothing's changed. I still love tacos and tonight....is taco night. For my guacamole I just combined the flesh of two ripe avocados, one diced tomato, half a diced red onion, a chopped red chili and clove of garlic. Finish with a squeeze of lime juice, pinch of salt and a couple tablespoons of olive oil. So simple and so good. Make this just before you serve up otherwise it will start to lose it's groovy green colour. So one of the best things about taco night was my mom's homemade salsa. She'd make up this massive salad bowl full of the stuff that would last all weekend, satisfying our regular chip-n'-dip cravings whilst slowly being decanted into smaller bowl after smaller bowl until the salsa was no more. Even though I've never managed to quite crack the flavours in my mom's salsa, this one's pretty good too. Chop up loads of ripe tomatoes - get them on the vine if you can, it makes such a difference. Don't worry about deseeding or taking the skins off, no time for that. All you need is a red onion, a couple of cloves of garlic, a green chili, and a handful of coriander. Dice everything up nice and small and chuck it in. 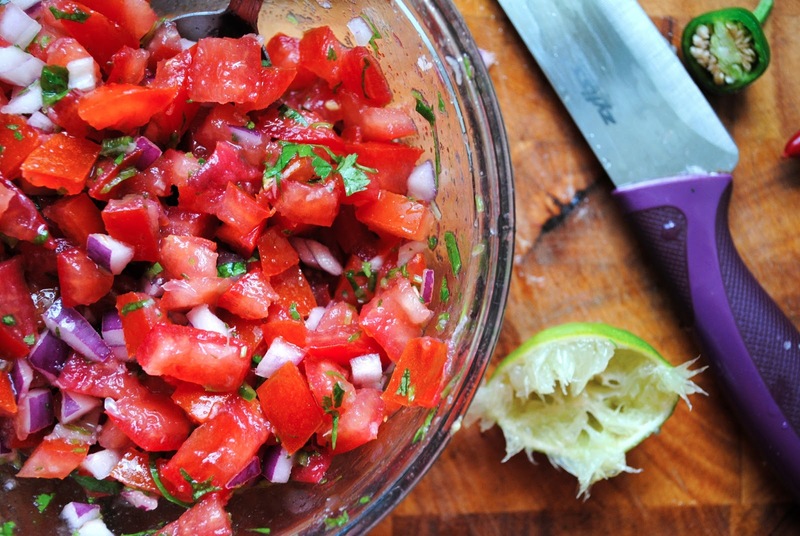 Squeeze of lime, pinch of salt and glug of oil and you're salsa'd up. I think my favourite thing about taco night was that we never ran out of food. With all the different bowls of meat and rice and cheese and whatnot to stuff in your tacos, you could go round after round and still there'd be plenty of fillings left over. That is, except for the refried beans. See in my house the refried beans never made it to round 2, thanks mostly to my younger sister. They were more of a 'get-what-you're-entitled-to-as-fast-as-you-can-or-Ellie-will-have-eaten-your-share' kinda filling. 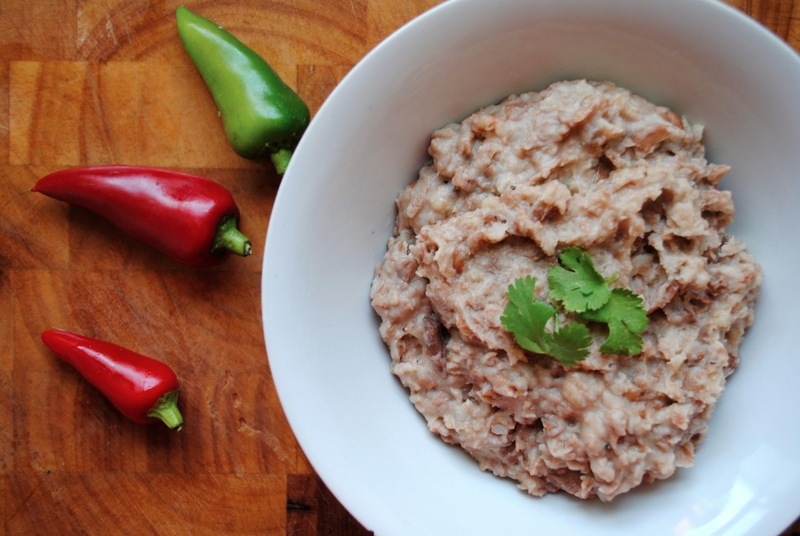 To make your very own refried beans just fry off a tin of pinto beans in a pan with a tablespoon of lard. When they've softened add a glug of olive oil and use a potato masher to squish everything up into a nice sloppy little mess that - for any doubters out there - it tastes ten times better than it looks. There's something about being able to eat the plate or bowl that your food comes in that just gets me even more excited about what I'm about to chow down on. Let's be honest...who here never desperately wanted to eat out of a nacho hat? The sort-of worrying thing is that as I watch that, I'm thinking - 'Now THAT would make a good blog post...' Probably not a good idea. To make your almost-as-cool-but-nowhere-near-as-dangerous taco bowls just pop a soft corn tortilla into a greased oven-proof bowl and stick it in a hot oven. Keep an eye on it, but after 4-5 minutes or so you should have some nice taco bowls. Well done. Now all that's left to do is assemble. I just went with some nice beef mince, fried with onions and some spices but this bad boy is welcoming of all kinds of meats. Pulled pork, spicy chicken, steak strips, even a few king prawns or some grilled fish. Some lettuce, your toppings, grated cheese and a scoop of sour cream to finish it all off. It really doesn't get better than that. I love taco night.